Excerpt from We Will Lead Africa Vol 1. Available on Amazon for full story and stories of other everyday African leaders, leading change and transformation on the continent. I am honoured to create spaces for the genius of our people so that their wisdom builds the future for their children and their children’s children. 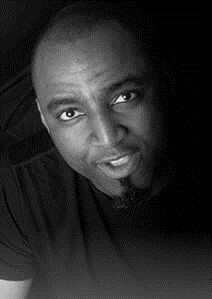 …In 2010 while working in Nairobi, Kenya with the African Leadership Centre, I was introduced to this incredible man, Dr. Martin Kimani. By this time in late 2010 I had developed a deliberate practice. I had seen Dr. Kimani twice and I automatically thought rugby player as well as Wall Street, both of which turned out to be somewhat right. We got along very well and right from our introduction we started talking about major African challenges and how to address them. I showed him the visual facilitation brochure for the work we did in Ibadan as well as the subsequent work on mitigating election rigging in Lagos, Nigeria. As Director of CEWARN-IGAD, he was quite intrigued and, unknown to me, he was looking at how a strategy could be created that would be participatory and live up to the purpose of his organisation. CEWARN (Conflict Early Warning and Response Mechanism) is a co-operative initiative of the eight IGAD (Inter-Governmental Authority on Development) member countries. The IGAD countries are the Horn of Africa countries of Djibouti, Ethiopia, Kenya, Somalia, Uganda, the Sudans, and Eritrea. It is to his credit that he took a risk with this stranger and asked me to develop a process for him for this strategy. Strategies are usually designs of the executives framed by reams of paper and multiple projections of the likely terrain. I was asking Dr. Martin Kimani to take a punt on a participatory process yet to be practiced by anyone we knew. If he was worried, it did not show. Such was his leadership that once he decided I was his man for the job, little would sway that. The staff were interesting with their own skepticism; the idea of eating an elephant one bit at a time was quite the attraction. Dr. Kimani and I seemed to have a good-natured pact whereby he would use his authority to clear the path and I would facilitate a participatory design and implementation. We would crowd source a strategy using the wisdom of multitudes across Kenya, Djibouti, Ethiopia, Uganda, Somalia, South Sudan, and Sudan. Eritrea, the 8th country, had suspended all IGAD Activities. We would work across Pastoralist Communities and war affected regions. The need for original thinking rather than a pale copy of prior western approaches is fundamental. I believe I offered a complementary leadership approach embodied in the design, development, and facilitation by challenging social engineering assumptions that have been the bedrock of many ‘paper’ strategies. We pioneered replacing past approaches with adaptive social technology that is embedded deep in my work around the Omoluwabi system. Omoluwabi is a term from the Nigerian Yoruba language, meaning good character. The Omoluwabi system I have developed is a new generation of Social Technologies and transformative systems based on our Pre-Colonial African culture of excellence. Adewale Ajadi is a creative consultant, leadership educator, change agent, and storyteller. Born in Ibadan, Nigeria, he has over twenty years’ experience working with people, organisations, and communities on issues that transform human interaction in the direction of meaningful dialogue, authentic interaction, and empowered value creation. He is currently the Country Director, Nigeria at The Synergos Institute. 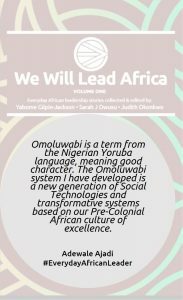 His book, Omoluwabi 2.0 – A Code of Transformation in 21st century Nigeria, offers guidance on achieving African excellence through values-based transformation. A barrister, Adewale has an MSc. in International Business Economics; he has also studied Leadership Education at the Kennedy School of Government, Harvard University and Complex Systems Theory in New England Complex Systems Institute, MIT. Ajadi is also a successful playwright, and his play, Abyssinia has toured the UK. This past week, Nelson Mandela’s legacy was celebrated on what would have been his 100th birthday. Simultaneously, leaders from all over the African continent gathered in South Africa to discuss all things leadership and change during the Obama Foundation’s Leaders: Africa program. Both Mandela day on July 18 and the Obama leaders’ week-long program were designed as calls to leadership and action. This is not only crucial to Africa today but for leadership in the current global world state. Speakers at the Obama Leaders’ program reminded us that so much progress has been made contrary to popular press. The fact that I could follow the talks from Vancouver, BC and be mind-mindbogglingly engaged, inspired and provoked to new thinking is a case-in-point of our collective progress. At the same time, the conversations reminded us that this is a time for leadership and action. “Worry less about what you want to become and worry more about what you want to do” 44th American President Obama urged. There is much to do. We cannot afford to rest on the legacy of our past icons or be content with the laurels that have already been achieved. The gatherings included conversation from iconic African elders passing the baton to reminders to young leaders that they are the leaders of NOW and that no title is needed to lead. The emphasis in true Obama style was on the ‘office of the citizen’ – emphasizing civil engagement and action as our avenue for progress and change. Yet in his town hall conversation, Obama was also clear in noting that our changemaking cannot be completely separated from our politics and that political leadership and governance are different. The message was clearly that governance, civil society and business need to work together for the collective progress of our future. Accordingly, the gatherings and town halls covered everything from ethical leadership to governance to entrepreneurship to education to social impact to business innovation to learning from failure to building transformative organizations and leading into the future. Ellen Johnson Sirleaf, Kofi Annan & Lakhdar Brahimi, summed up the leadership principles that seemed to be the ethos of the leadership dialogues in their various commentary during the elder town hall: You are never too young to lead, We are never too old to learn. You must lead by working with a team, you never work alone. Learn to trust your teammates and pass the baton. Dream (and act on) ridiculous visions. Be awake in your dreaming and be conscious of the sacrifices inherent in leading collective change journeys. Leading may require breaking boundaries and status quo systems (age, gender, social norms). Be willing to make hard decisions in the interest of the collective. Stay the course. The events of this week have strengthened my resolve to a personal transformative leadership practice and to taking leadership action within my organizational work as well as in the leadership and social change issues that I feel called to. In particular, the dialogue from Mandela Day and Obama Leaders: Africa reinforced our committed to our mission for We Will Lead Africa. Our mission is to create platforms for sharing and inspiring everyday African leadership through storytelling. The leadership lessons and inspirations from the week aligned with the research and evidence-based principles we have found common across the everyday leaders whose stories we curate and share. Africa A focus on a prosperous continent, where divides are bridged and leaders work across boundaries and borders to achieve a broader success. The dialogues on governance and women’s contribution assured me that we are on the right track for our 2018 calls for submissions. We are indeed the ones we have been waiting for. Black Panther and Wakanda fever have abounded these past few weeks. It’s been contagious and nearly impossible not to catch the bug if you are of African descent living abroad. I’m not even a traditional superhero fan. I can boast only of new recruit status since I’ve had children – and I’ve been swept up in it all too. You may be wondering why the euphoria and why this fictional movie in a fictional African country called Wakanda, about superheroes, no less, matters. After all, it’s all made up, isn’t it? It is all made up…and so are all of the rules we live by. It’s all story. What we call fiction serves the purpose of reflecting ourselves back to us in ways that allows us to tell, share and yes, provoke change in some of those made-up rules we live by, when a story helps us see how ridiculous they are. Narrative and storytelling can be an act of social change. Remember, we make social rules…and we are the only ones that can change them. As one of our contributors to the We Will Lead Africa volume 1 says: narrative drives perception and perception drives behaviour. Therefore, to drive lasting change for issues that no longer serve our societies, we must start with the narratives we tell and live by and the perceptions that are thus created – anyone working in any arena of behavioural change will tell you that attacking behaviour is like attacking symptoms of an illness and not curing the root. Change may occur in the short-term but it will not be lasting. Blank Panther is brilliant as a movie that addresses social change issues at the level of narrative and perception. It flips dominant racial roles (“Great – another white boy to save”/ “Don’t scare me like that, Colonizer!”). It defies normative depictions of dark-skinned women in mainstream Hollywood movies (hairstyles were afrocentric and Team Natural all the way!). It flips colorism by casting very dark-skinned leads. Beyond this, the Black Panther movie shifts the usual mainstream Hollywood narrative of peoples of African descent. The characters are everything I know the people I grew up among and continue to see around me to be – intelligent, humorous, relatable professional leaders, facing all the usual challenges humans contend with: fear of the unknown, negotiating difference, social justice, love and hate. I would usually say “duh,” because of course this should be unremarkable. Any good story should do these things, right? And therein lies why this wholesome depiction of the nearly all-Black cast of characters in Black Panther is remarkable – because it is a far cry (other than the generic African Hollywood accent) from usual stereotypical narratives of the poor, inferior, war-torn/conflict-infested, diseased and defeated peoples of African descent in Hollywood’s mainstream depictions. And this movie was not made by an independent or black-owned studio, nor is it in a movie genre where this (such as nearly all-black cast) would otherwise make sense. As I have written elsewhere, Black Panther is fundamentally about a holistic representation of Black/African identity, where it is usually under or misrepresented. For these reasons, it is a statement movie worth celebrating. In this sense, it may be as epic as movies like Guess Who Is Coming to Dinner or the Spike Lee blockbusters of the 80’s and 90’s that propelled black entertainment industry into challenging mainstream movie norms. The lynchpin and perfect example of how current mainstream narratives of Africa drive perceptions in the world around us rests for me in the outtake. TChalla, King of Wakanda and the Black Panther himself, brings his plan to the UN General Assembly to share Wakanda’s technology with the world. After he speaks, someone in the assembly responds: “With all due respect, what does your country have to offer the world?” Our belief, at We Will Lead Africa, is that we can already begin to smile the way TChalla did in response – that smile that says: just you wait and see what’s coming. The prosperous position that the fictional Wakanda finds itself in is in fact in our reach. Leaders on the continent in every industry ARE already leading. STEM and Tech acceleration is flourishing. The private sector is growing. Women are leading. We are posed to have the youth and labour force to further accelerate development in the next decade through entrepreneurship, innovation and new industries for job creation. And for the first time since our independence movements, social media and citizenship organizing are driving demands for governance changes needed to advance the continent. That is why our calls for stories this year will focus on our advances in governance, tech and women’s leadership. We are ready to lead and own our own narratives. We are moving from a narrative where what we have to offer is taken while we are perceived as worthless, to one where we own and set the terms for what we choose to share with the world. So watch out world – We Will Lead Africa. 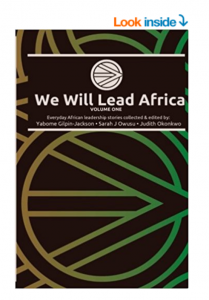 We are standing on the eve of the launch of We Will Lead Africa Volume 1, a first-of-its kind edited volume of 30 everyday leadership stories. I’ve just re-read the opening sentence 3 times. Staring at the words, I am breathless with excitement. I pinch myself and can hardly believe that we are here. We did it. Sarah Owusu, Judith Okonkwo and I, along with our 30 wonderful contributors who wrote and rewrote their stories to capture the vision we had in mind. Fifteen months after our first conversations, we are delivering what we hope will spark new conversations about leadership in Africa and inspire further action. We continue to dream of a prosperous Africa for all, driven by the pioneering and relentless action of everyday Africans, who choose to be in service and leadership for the continent. This first volume tells the story of only 30 of the people we interacted with on the journey to getting submissions – there were so many more and exponentially more out there quietly working! I come across and read about everyday African leaders in action on and off the continent every week. We have only scratched the surface. We hope to go deeper still and further inspire action for change and progress on the continent by helping to tell and share these stories of what’s already working. I believe our editorial team came to this work fully qualified to do it. So when I say “I can’t believe we’ve done this!” I do not mean that in the sense of incredibility but with wonder and awe in what can get done when passion, dedication and the power of vision come together. This may sound cliche but if there’s anything the past 15 months has reminded me of, it’s that competence alone accomplishes nothing! I had dreamed of, journalled, talked about and written notes about We Will Lead Africa for a full year before I (we!) did anything about it. When I met Sarah and Judith, they likewise had touched on and worked on the edges and front lines of leadership in Africa. The difference was that we met (very briefly! ), and in two short Skype calls after that, alchemy happened. Our scattered individual visions became our shared vision. They both said: “let’s do it!” And on that second skype call, Sarah, the perpetual activator and planner started a Google Doc and asked: “What are our next steps?” Within the hour, we had an action list and the next call scheduled. Fuelled with the power of passion and dedication, we all three followed through on our initial actions. As Lao Tzu said, “The journey of a thousand miles begins with one step.” Two or 3 months later, we were still talking weekly or bi-weekly and consistently following through on our commitments to each other to launch the project, in spite of incredibly busy lives. We all three have also been leading and doing other work while at this as well as Sarah and Judith have also shared in their posts. This journey has been easy because of the incredible partners and friends I’ve found in Sarah and Judith. They were already partners in business but they fully welcomed me and never once made me feel excluded. We continue to work as equals. I am so grateful to you two! I remember one of my sisters asking me early on: “Who are your partners in WWLA, again?” I chuckled, replying: “You know what’s funny? I don’t even know these women!” I then described our brief meeting – seriously less that 30 minutes and maybe 5 sentences shared between us – and what followed. My sister agreed with me that sometimes when things feel right, it is worth just stepping out in faith and trust. That week, when we got on our call, I mentioned my conversation with my sister. In the quiet wisdom and depth that I have come to love in Judith, she responded: “You do know us, Yabome. You already knew us because everything you said aligned with everything we’d been thinking and standing for. We already knew each other.” She couldn’t be more right (she always is, dammit!). Sarah simply replied in her quacky get-over-and-on-with-it voice: ‘You know us now!” They heard my quiet unspoken, closed question: Will we make it through this journey with the brief history we have together? On another call, I remember saying I was waiting for the honeymoon to end. It never did. The kinship of Africa joined us even before we physically met. We have now laughed together till we are giddy and crying. They’ve known me enough to scheme behind my back to appreciate me which made me cry for real (an incredible feat!). We have shared joys and sorrows, hopes and fears. Simply put, I have grown to love these women. I stand with these two now (and all of you!) in sisterhood, solidarity, faith and trust that We Will Lead Africa. We, Sarah, Judith and I, are committed to advancing stories and action for everyday leadership in Africa. We are committed to modeling the leadership we are telling stories about. We are committed to the idea and promise that We – the collective of everyday African leaders, Will – by sheer determination, grit and courage to see beyond the improbable, Lead – in service in every sector and sphere we find ourselves, Africa – vested in the prosperity of the whole continent in all its diversity. I want to dwell on We for a moment longer. In a recent workshop I led on leadership a participant said: “Look across your cities, where have you ever seen a statue of a committee?” I was struck by this and have been thinking ever since that that is especially the leadership mindset that needs to shift for Africa and Africans. I believe we need to go back to celebrating individual excellence in the context of collective action and impact in Africa, because we need to scale our impact for the advancement, prosperity and self-sufficiency of our continent. Isolated action will not give us the reach and scale we need. We, need to do this together! This journey has deepened my commitment to passion work, soul work and to leading by example. So again, I invoke a cliche that I have found to be true…please follow your heart. Please do the work that your soul leads you to. Take your passion for what seems simple and small in your eyes, build a vision around it and watch it grow. One of our contributors, Modupe Taylor-Pearce wrote back to me after seeing an initial draft of the full volume: “Congratulations to all of you for successfully assembling powerful stories of hope (“Chicken Soup for the African Soul…”)…This is chicken soup for the African soul! It will be hard to read the volume without being inspired by these incredible leaders! But we are not satisfied simply to inspire you for a moment. We exhort you to take action. Please. Africa needs it. We need each other. You see, I was a straight A student. I loved reading, studying and being on top of my school work. I was committed to academic excellence. I’d get my paper written and submitted on time and still make it to whatever party was going on. In general, I was always super prepared for tests, assignments and exams. My sister was right – academics were my Olympics – the thing I was committed enough to, to practice every day and put the proverbial 10,000 hours into. In many ways, it is still the sport I am committed to now, expressed in my ongoing writing, facilitating, publishing and conference presenting. So my question today is: What is your Olympic sport? I believe we all have a sport we are playing in this game called life. Ideally, it is the sport that brings you joy, in which you experience flow when you are in practice. It is the one thing you desire to practice until you achieve some level of mastery and make a contribution to the world through it. It is the thing that drives your purpose. And purpose, in our humanity, anchors our identities and the reason for our existence such that unless/until you are running your own race, there is a profound sense of emptiness, like you are missing something. My inquiry into: “what is your Olympics?” is a call to each of us to find our own sport and as Saint Peter put it so long ago “let us run with endurance the race set out for us.” As in the Olympics, there is a competitive side to the game of life in which we play to win medals. However, far more important than that is the sportsmanship award. This is the award that goes to those who show-up, participate fully, endure to the end and inspire others as a result of their sportsmanship. This year, my Olympic inspiration came from the first ever Refugee Olympic Team. They win my sportsmanship award. This team of 10 chose to show-up and participate fully. They did not win a single medal, but right from being welcomed with the loudest cheer at the opening ceremony, they had already won. Their race was to remind the world, at this time of global refugee crisis, of the humanity of refugees. That refugees are people, like you and I, who have hopes and aspirations and who dare to dream of changing the world, and to live on purpose. They reminded us that “no one is ever just a refugee” as Chimamanda Ngozi Adichi said in her World Humanitarian Day Speech on August 22, just a day after the Olympics ended. They showed us loud and clear, that refugees can and do achieve many other things once they are welcomed into new home countries and communities who dare to see the possibility of a shared future with those seeking refuge. Countries and communities that choose to show-up, endure the initial complexities of integrating others and then become an inspiration to the world when they show that it can be done. I have a feeling we have only just began to see the impact of this historic Refugee Olympic Team. I share a piece of this Olympic Refugee Team’s story. I ran my academic race because I too had been a refugee and arrived in Canada determined to make-up for the years I had lost in translation. I won a kind of gold medal in return, graduating at the top of my class with the Dean’s medal. An award that was published in the university news online post and then released to the press under the title: “Refugee earns top business medal.” I was ruffled by the latter choice of title, resentful to have been pegged solely with my refugee experience for publicity of the story. And in many ways, that is a classic example of why part of my Olympic sport now is telling those stories less told, such as stories of African leadership and identities. Because, unless we tell our own stories, others will continue to do so for us. That’s why We. Will. Lead. Africa. So how about you? What is your Olympic sport? The 21st of September is The International day of Peace – what grand and idealistic words. Some might even say naïve. What good is one day of Peace in the face of global conflict, war and crime? Can people ever be truly peaceful? And what does it even mean to live peacefully? I have been reflecting on these questions for a long time, and in 2013 I had the honour of working with Peace One Day – the organisation that ensured that Peace Day became a UN recognised day of global unity and intercultural cooperation, and whose objective is to institutionalise the day as one of taking action around the question: who will you make peace with? Personally, this question has come up for me again recently as I was faced with my own visceral anger. It was a few months back when a close friend spoke to me about how the relationship she was in, one that had been escalating for some time, had reached a point where she could no longer stay. I sat up with her late, listening to her talk about the latest and most vicious interaction that they had and welling up at the sight of the bruises on her chest and arms. Listening to her story, I was frustrated and angry at how little I felt able to do – and the anger stayed with me. I see anger as a great tool to help you identify your boundaries, your hard lines, your convictions – and for me, here I was faced with my own anger, a clear pointer towards something that I did not want to see in the world. Experiencing anger in this way, allowed me to activate the transformative power behind the anger – so I was left with another question: what alchemy can I make with this feeling? It is with this energy, that I am convening a dialogue on Peace Day this year for a group of women to discuss gender based violence, it’s impacts and the healing and action that we can take to counteract it. And crucially, we will be using the space to come up with a simple tool for spotting the indicators of manipulative and abusive relationships. I do not think that the idea of one day of Peace is naive, and I do not question the impact of this day. Behavioural change and change of mind starts with awareness, conversations and insight. Peace One Day are supported by McKinsey who measure the impact of Peace Day – they estimate that of the 709 million people aware of Peace Day in 2015, 13 million of those act more peacefully on the day (Peace One Day 2015 Report). Social movements theory also outlines the power of distributed action and the concept of “Big Task, Small Ask” (Wilde, 2016) as the way to most impact. The latter points to the fact that when faced with a seemingly insurmountable task, as many social changes appear, it needs to be broken down into smaller manageable tasks that individuals can own and implement. I believe that these examples of everyday peacebuilding and leadership can make a real difference. Globally, one in three women have experienced either physical and/or sexual violence in their lifetime (World Health Organisation); a key way to prevent this is through awareness and catching potentially violent behaviours before they begin. In the We Will Lead Africa volume of everyday African leadership that I am editing (with my co-editors, Yabome and Judith), we include a powerful story by Fatou Wurie who implores us to support, listen to and take seriously the many survivor stories of women and girls who have faced sexual and violent abuse. There are many people doing extraordinary things every day to counteract violence and build peace – I will be shining a spotlight on that on Peace Day. Peace Day is about doing something, taking action – big or small – from exactly where you are standing. So, Peace to you, and who will you make peace with? – Peace One Day 2015 Report can be found here. – World Health Organisation Fact Sheet on Violence against women reviewed in 2016 can be found here. – Joanna Wilde (2016), The Social Psychology of Organizations: Diagnosing Toxicity and Intervening in the Workplace. London: Routledge. – Fatou Wurie (2013), Not Just Another Gender-based Violence Statistic. Online for Huffington Post here. I watched Captain America: Civil War recently. If you have not already watched it, don’t worry no spoilers follow. However, it is common knowledge that it features one of Marvel’s few African Superheroes, the aptly named Black Panther from the fictional land of Wakanda. Before watching my brother had warned me that I may need a dose of patience as Hollywood’s generic “African” accent is used liberally. You know the accent I mean, the one that seems to occur in all Hollywood movies to represent Black Africans south of the Sahara, with the possible exception of South Africa. Despite this, I enjoyed the movie enormously (no points here for guessing that Marvel comics featured in my childhood and I remember them with great fondness), and a large part of this enjoyment was linked to the presence of T’Challa – regal, Wakandan, purposeful, and above all relatable. Chatting with my brother later, I told him he was fortunate I had not watched the movie with him in Houston as it was quite possible I would have yelled out “Igbo Kwenu! !”* at every move the Black Panther made. I am British, but before that I am Nigerian; Igbo if you know the country beyond the name; from Imo State if the geography is familiar. This has always been true for me, but I have become progressively more African. I will explain what I mean, I grew up as a diplomat’s child. Like my siblings, I was born in the UK, and left as a toddler to then go on to live in Austria, Sierra Leone, Nigeria, Indonesia and by the time I graduated from high school in Japan I had my global citizen game down. Subsequent visits to Asian, European and Nigerian cities would evoke a sense of “home”. I consider myself a unique blend of experiences that have culminated in an appetite for and desire to gain and promote knowledge about leadership in a manner that facilitates a diversity conscious approach to leadership and management development in global organisations. I was keen to pursue research in partial realisation of my dream of contributing to the growth and development of a ‘glocal’ approach to individual wellbeing in the workplace. It’s a bit of a stretch but bear with me here – I have been fortunate to interact with various international organisations (NGOs, corporates etc) that do work in African countries, too often I would encounter the same story ‘it is so difficult to work in Africa’, ‘we are not able to develop leadership talent there’, ‘the culture/ways of working/ societal norms do not promote the work ethics we require’…and the list goes on. I believe that there must be a way of working – in this case distilled down to leadership principles or a framework – that will resonate with people in Africa, be accessible via their own preferences or inclinations, and lead to impactful effective leadership and management. A style of leadership that does not necessarily follow Western paradigms, but will nevertheless deliver the results showcased through impact on the continent. A type of leadership that we must tell stories of. It has meant that I have spent the last 3 years doing research on leadership in West Africa for a doctorate. It has meant that 6 years ago I developed a leadership coaching model based on the Oriki of the Yoruba people. It has meant that my company would be named Ìmísí, to breathe life into, to inspire…and that my work in some way now always connects me to this belief. Just a few hours left, please share your story today! Connect – from the Latin con and nectere, meaning to bind together. Inspire – from the Latin inspirare, breathe or to blow into; conjuring up the images of something divine that is able to fill us up with an idea, or truth, with just a breath. Transcend – from the Latin transcendere, which is made up of the word trans meaning across, and scandere, to climb. Upwards, and beyond. In story telling, life or ‘vividness springs from the names of things’ (McKee 1997: 395); searching for and using the right words for things is an art, and I am always awestruck by the concept of communication. I formulate and idea in my mind, wrap it in words that I send to you (written, virtual, via vocal chord and eardrum vibrations) and that you then decipher into images in your own mind…the better the words, the more accurate the communication. What magic! In Speech Acts (Searle, 1969) we can see the power and authority that some words hold: like declarations. A declaration of peace, or of war, the declaration of human rights … just by virtue of being voiced, they can change the trajectory of lives. Speech really can do something – it can put things into action. My passion for words and for story telling has led me into a career centred on dialogue and conversations. Working in organisations, brokering and facilitating conversations and helping teams make meaning of their strategy and vision; coaching individuals from a variety of backgrounds, industries and cultures; I have learnt that narrative and story telling is a powerful tool for transformation, connection with others and purpose-filled action. We shape our identities, our sense of self and sense of belonging through stories – as I let my mind wonder, I think about the narratives that I am a part of, the stories I hold onto about myself and others. Some are accurate, some are not – some are empowering, others may be harmful. I am energised and inspired by the change and impact that I see all over the African countries that I work, travel and live in. I believe that the We Will Lead Africa volume will amplify this. By creating a platform for stories of African everyday leadership to be heard – stories that haven’t yet had the space and attention that they deserve – we are redefining what we see for the future of the continent and it’s people, and we are spreading stories that will fill others with hope and inspiration to play an active part in bringing their aspirations to life. Part of moving forward, is to imagine the Africa that we want for the future. We Will Lead Africa is an opportunity to come together to take a close look at all our stories, to uncover those that are most powerful, and importantly, to be the authors of our own stories. ‘As we begin to embody our own genuine expression, we find our voice has magic in it … Speaking our voice can transform our circumstances.’ (Isaacs, 1999: 160). As we speak, as our stories are broadcast, we will see that we are not only expressing thoughts, but that we are bringing into being a world – as we speak, we begin to create a new reality. And so I leave you, with some questions about your stories: What stories sustain and uplift your sense of self, and connect you to others? What stories would you tell to inspire action from others around you? What could move us beyond where we are now, enable us to transcend the stories that hold us back, and bring into being those that propel us forward? Send us your stories of everyday leadership for the We Will Lead Africa volume. Searle, J.R. (1969) Speech Acts: an essay in the philosophy of language. Cambridge, UK: Cambridge University Press. Richard Couto’s words struck a chord with me. On the day I first read these words I was researching and writing a conference paper on African Leadership Narratives. When the call for abstract submissions for the said conference had floated into my inbox, I’d read it with some interest and then filed it to come back to. I promptly forgot about it and when I recalled that I might have been interested in making a submission, I had missed the deadline. Suddenly, I realized I really, actually, wanted to submit an abstract. It was the 3rd bi-annual Kwame Nkrumah Conference, which happened to be taking place in Richmond, British Columbia, Canada, just about an hour from where I live. There was a long list of topics for possible submissions centred in and around issues of African development, including our resource abundance and development scarcity, the colonial history, the state of pan-Africanism, the question of our failed leadership, roles of the Diasporas, Brain Drain and Gain …This list felt like every dinner conversation, every newscast and every “why Africa’s situation is hopeless” interaction I’d been in. It was the necessary, guttural, painfully raw story, documenting why we, Africa and Africans, are in the more difficult situations we find ourselves today. It is a Lament Narrative, needed to grieve losses and facilitate healing. But Lament Narratives to the exclusive of hope and action stifles and suffocates progress and inadvertently reinforcing a narrative that we are powerless against the ocean of despair we face, filled with all these strenuous factors. We were telling and retelling the story we are a part of without asking: What are we to do? As I looked at the list I realized I had something to say and contribute. It was not on the list and I was late, but I took a chance and sent in my abstract for a paper and presentation titled African Leadership: Now and for the Future, to be in the Conference Track: African development: Resource curse or leadership curse? This conference submission was one event in the storyline that has brought me to We Will Lead Africa. At the time I’d been carrying the vague uneasiness that precedes the possibility for change, the choice to just do something different but I was not sure what my unease was about and what the something I needed to do was. I had studied and worked in the field of leadership and organization development/change for a while and thoroughly enjoyed my work but craved more intellectual stimulus. To gain that, I went back to graduate school fully intending to do a ‘usual’ leadership and organization development doctorate dissertation and degree. The kink in my plan was going to a school renowned for its commitment to social justice and change and for preparing passionate scholar-practitioners to not only lead organizational change and development but lead and make social impact using our systems change skillsets (What was thinking?!). So in following my passion for how to shift African Development and immigrant/refugee narratives, I ended up researching transformational African leaders, living and working in the UK, US and Canada, while being world changers in their communities locally and/or back in their African ‘homes.’ This, in spite of every real and stereotypical hardship that came with the significant war traumas they had experienced in Rwanda, Burundi, South Sudan, Sierra Leone, Liberia, Congo-Brazzavile and Ethiopia. These, my sheros and heros were everyday leaders, a community worker, a student, a software engineer, an environmental specialist etc., contributing whatever skillsets they had, with a whole dose of passion, and making significant changes in narratives that seemed otherwise bleak. These, were answering the questions for themselves: What are we to do? What part can I play? They were writing new narratives of leadership in and for Africa that are hard to find at the dinner table, on newscasts or on that conference abstract list. I wanted to share African leadership narratives like theirs – transformational, yet marginalized. Because I also know from my leadership and systems change scholarship and work that albeit a slow process, shifting narratives, will shift beliefs, will shift individual and collective action and will lead to change and transformation…and I KNOW this is already true across the African continent. I know this, because by the end of researching and writing that conference paper, and subsequent research and work I’ve done, it is clear that the alternative narrative of everyday leaders making a difference is already happening. And for those of you thinking it, yes, these rumblings, these isolated narratives feel like drops in the vast oceans of our needs right now. But that is exactly why we must hear them some more, share them some more and disrupt the status quo narratives some more. Remember that saying? Little drops of water, make a mighty ocean. We Will Lead Africa is one way to start collecting the drops, to build networks, to share ideas and to further precipitate the en-mass leadership change already happening for Africa. Everyone who draws breath “takes the lead” many times a day. We lead with actions that range from a smile to a frown; with words that range from blessings to curse; with decisions that range from faithful to fearful…when I resist thinking of myself as a leader, it is neither because of the modesty nor a clear-eyed look at the reality of my life…I am responsible for my impact on the world whether I acknowledge it or not. So what does it take to qualify as a leader? Being human and being here. As long as I am here, doing whatever I am doing, I am leading, for better or for worse. And, if I may say so, so are you.